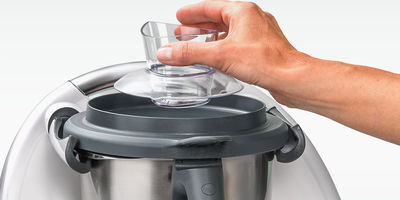 There are many ways to prepare and cook healthy, nutritious meals with Thermomix ®. Whether you use one of the many easy-to-follow Guided Cooking recipes, adapt your own recipes to Thermomix ®, or use the Thermomix ® as a tool to take the hard work out of preparing delicate sauces or kneading dough, it’s so quick and simple to achieve perfect results. 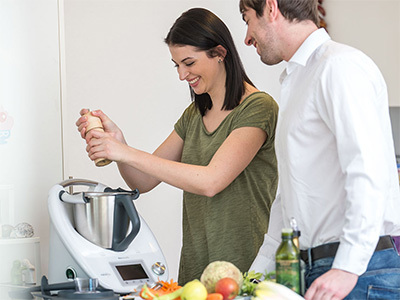 The concept of Thermomix ® is based on a perfectly complimentary combination of sophisticated, intelligent technology and a wealth of recipes perfectly tailored to the Thermomix ® for guaranteed success. Finding new ideas and inspiration is even easier with our Thermomix ® Recipe Platform – an extensive online resource that offers thousands of recipes that can be accessed using your computer or mobile device via the Thermomix ® App. 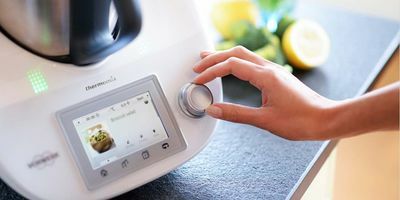 You can even call up recipes directly on your Thermomix ® with our Recipe Chips, which let you see the recipe on the touchscreen as you cook and guide you step by step. There are now even more ways to cook your way to perfect results. With so many functions in one device, you can take full control and use your Thermomix ® to take the effort out of virtually any recipe. With classic Thermomix ® cooking, you save time with a device that can prepare ingredients as well as cook and mix at the same time. This leaves you more time to do other things in the kitchen or simply relax. To make things even easier on you, we recommend Guided Cooking: Just select a recipe from your Recipe Chip and follow the steps onscreen; the recipe’s time and temperature settings are automatically programmed in. Making incredible food at home has never been easier. Thermomix’s ® Guided Cooking is the innovation for guaranteed success that takes you step by step through recipes to achieve perfect results. Time and temperature settings are set automatically by your Thermomix ® – cooking has never been easier!